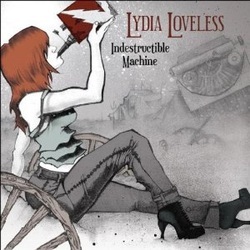 Lydia Loveless certainly has a lot going for her with so much youthful energy and sassy in-your-face musical attitude. Whether she is someone that will be able to develop her particular strain of punked up country with a rock ‘n’ roll attitude into something that is long lasting remains to be seen. I’m also not sure that some of the hype does her any favours either. I made the mistake of reading a few of the already published reviews of this pretty good album and had my expectations boosted way beyond what this album actually delivers. Don’t get me wrong. It is a very good album that contains several memorable songs. She is a talented singer and a pretty good songwriter and fairly obviously has a decent band behind her. The instrumentation is a little dense at times, almost as if they are trying too hard to fit all of the instruments into the sound and this at times gets in the way of the lyrically dark tales of an outsider. Certainly the punky lack of sophistication gives the music a lift but also gets in the way of some of more overtly ‘country’ songs. Some restraint is shown on the excellent ballad How Many Women, where there is less fiery guitars and stronger use of steel and fiddle on this gorgeous tale of a ‘two timing man.’ Her vocals are highly emotive and despite the restraint shown there is no lack of sassiness! The album kicks off pretty much as it continues, (with perhaps a couple of exceptions) with a deluge of electric guitars, but with a plaintively plucked banjo just as evident, notifying the listener that this is as much a ‘country’ album as it is a punk one! Subtle it certainly isn’t and yet thanks to songs such as the already mentioned How many women, she is more than capable of slowing down and showing a little tenderness! Jesus was a wino is a decent, raunchy country song with some excellent twangy guitars not quite buried in the wall of sound, whilst Steve Earle, despite being the tale of a stalker, is actually a pretty good mid tempo country rock song, as is Learn to say no. Do right goes back to the chiming punky guitar driven wall of sound with a little punk attitude, also including some nicely played banjo. The final song, Crazy is an excellent album closer that displays all of her sassy attitude on an acoustic guitar driven story about trying to avoid hopelessness but without any real chance of doing so, accompanied by a hauntingly mournful fiddle. It is very much an album that seems to improve with each subsequent listen, even gradually revealing a few little subtleties that on the first few listens may not be evident (or they were’nt to me!) It will be interesting to see how her sound develops over the next couple of albums.